And now, what you’ve all been waiting for–the winner of the $25 gift card to Starbucks! First, I want to thank everybody who entered for their kind comments. Those really made my day. I appreciate you taking the time to share my Transform Your Home, Transform Your Life Challenge. Also, just FYI, in future posts, I am going to be sharing more of my thoughts so you can get to know me better. These could be serious thoughts, or funny thoughts. In return, I would love to hear your serious or funny thoughts in the comments! Next week, I’ll be sharing my thoughts on running in my post on Creamy Roasted Red Pepper and Basil Soup. I know running and soup are unrelated. Just go with it. I love caramel apples. The contrast between the sweet caramel and tart apples is like a burst of heaven in my mouth. Add to that the buttery, crunchy topping of an apple crisp, and you have a recipe for rapture. Just kidding. I’m waxing a little “over the top” here. 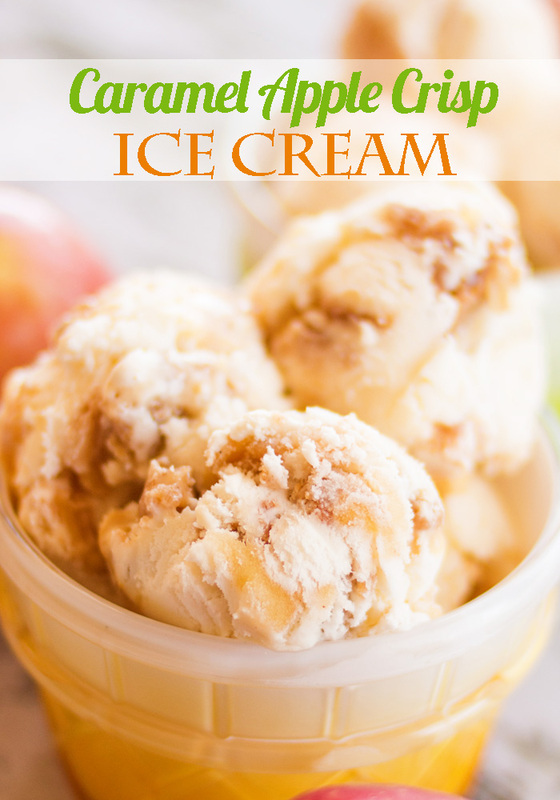 But seriously, I love these two fall desserts, so I decided to combine them in an ice cream flavor! You’re going to use my Classic Vanilla Ice Cream for your base, but there are a few things you need to do first. Like make the caramel, apple pie filling, and crumble topping. Each of these things is easy, but each takes some time and needs the opportunity to cool before you can add it to your ice cream. 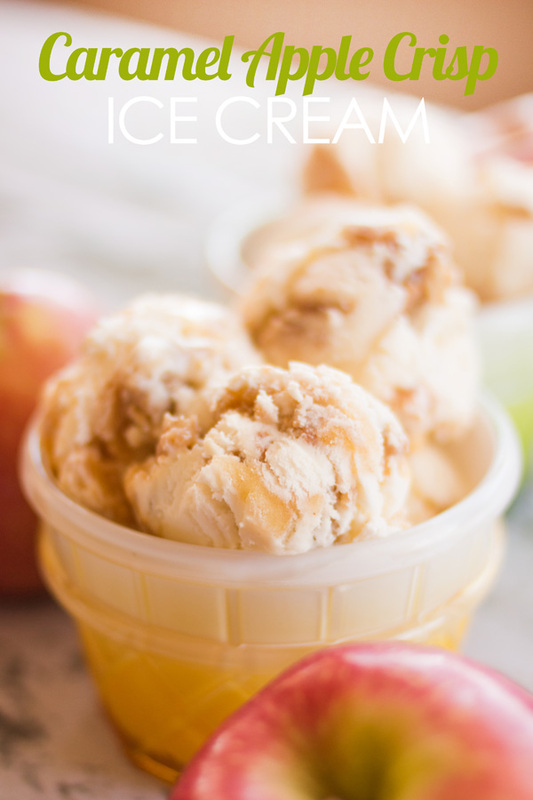 If you don’t want to take the time to make the caramel, you can purchase caramel ice cream topping from the store and use that instead. You could also purchase the apple pie filling if desired. Ready to make this amazing ice cream? Let’s get started! Apples are ranked as one of the “Top 10 Healthy Foods” by Medical News Today. They have been shown to improve neurological health, reduce risk of stroke, lower levels of bad cholesterol, reduce the risk of diabetes, and ward off breast cancer. (See Apples: Health Benefits, Nutritional Information). Cook all Apple Pie Filling ingredients over medium heat until thickened. Remove from heat and let cool. Break the Crumble Topping for Ice Cream into bite-sized pieces. Make the Classic Vanilla Ice Cream. 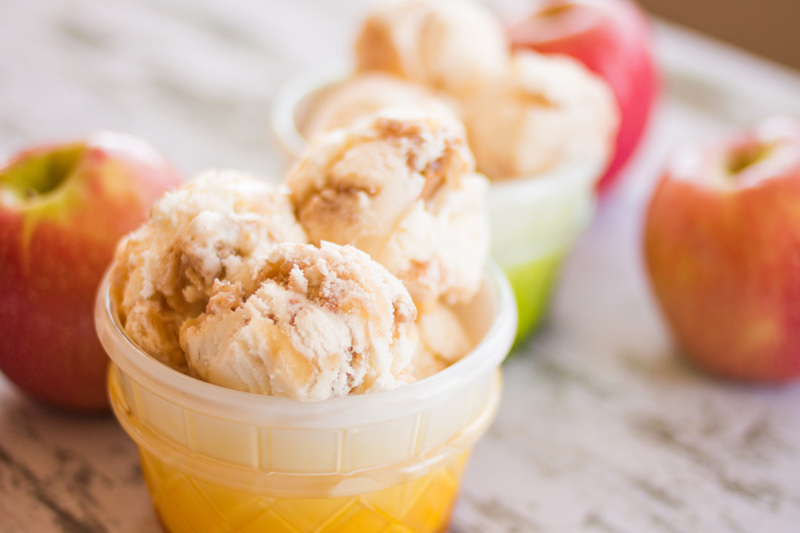 When ice cream has reached soft-serve consistency, transfer it to an airtight container, layering it with the caramel, apple pie filling, and crumble topping. (Note: You will mostly likely only use about half of the can of caramel and half of the crumble topping). Freeze for several hours or overnight. I NEED this ice cream in my life! It looks amazing!! Thanks Trish! I appreciate you stopping by and commenting!